If you believe in nothing else in life, believe in angels. Believe in love and humanity, compassion, and the transformative power of service. I personally know a few angels and one of them is named Jennie Towery. If you have closely followed my blog, you might remember she was the Relief Society president ( the women's organization in my church) when Lucy died. 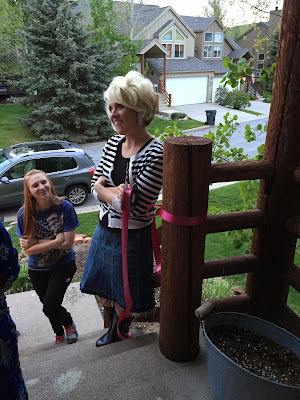 She sewed Lucy's burial dress ( without being asked), organized every detail of the funeral, and even saved some of the fabric from Lucy's burial dress in case I had another girl and she made Zoë's blessing dress out of it. 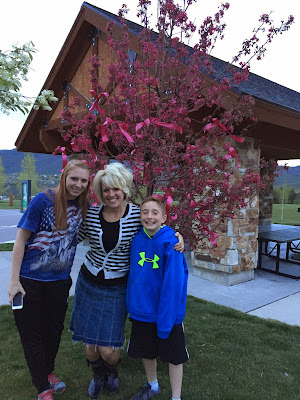 Every year, for 7 years now, she ties ribbons on Lucy's tree in the park, (the tree was a gift from my Peter Pan cast) as well as around our home. 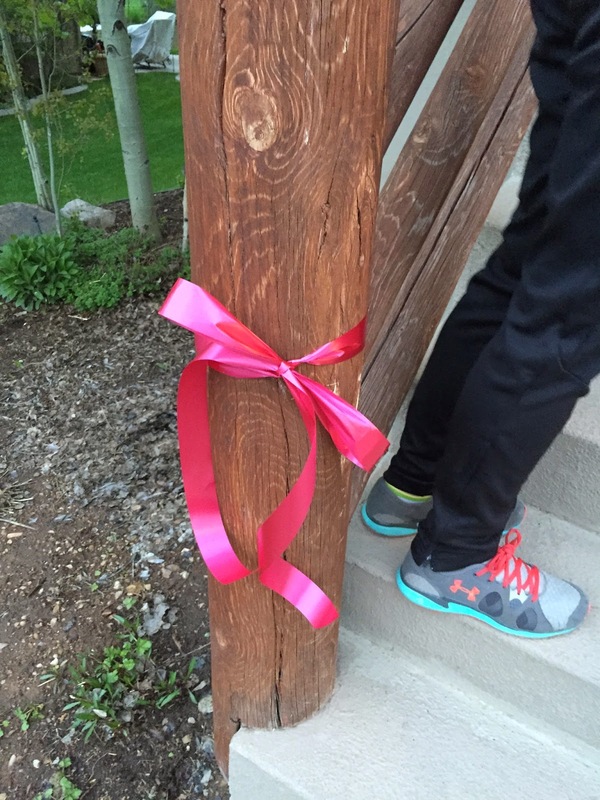 She even drove to my parent's house last May in SLC and we woke up to see pink Lucy ribbons everywhere. 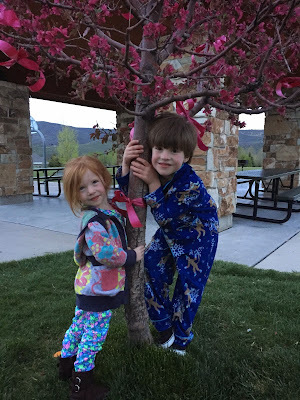 Last night, while getting ready for bed, we saw a car pull up in front of our house. 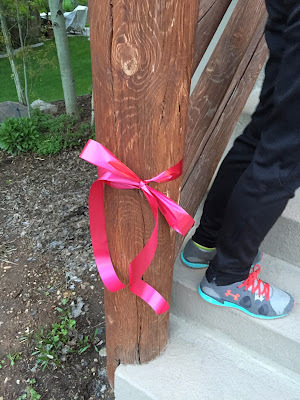 Jenny and 2 of her kids were armed with pre cut ribbon,ready to decorate our house for our Lucy sweet. Today marks 7 years since she choked. 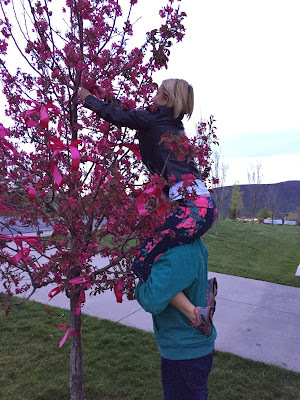 Jennie was taken off guard when we opened the front door ( tears in my eyes) and although it was bedtime for the kiddos, we jumped in the car to join her at the park to tie more pink ribbons on her beautiful flowering crab apple tree. I believe in Angels too:) Thank you for sharing your story with the world. Your three babies are so blessed to have you as their Mama. You. Are. Amazing. I believe in angels....from both sides. Angels here on earth who saved me too and heavenly angels that look after me day after day, watching close by. Jenny is certainly an angel. My friend and her husband came to my house the Monday after my husband's funeral to plant a Magnolia tree. My friend listened to me whine and cry every day for months. She never got tired of my tears, fears, heartache, sorrow and just listened and cried with me. Now that is a real true friend and angel. Most people would have given up on me a lot sooner but she never did. I'm glad we have angels. Love can heal. Love never ends.